Compliments to Tom and Rob for their good work. Everything was done to my complete satisfaction (very unusual). I know the jobs were small but your guys were terrific and I’m a very happy customer. Matthews Electric has been working with us for at least ten years at our home. Every time your crews arrive they are professional, competent, and courteous. Today, two members of your company arrived early (no problem) and started to scout for a place to run a cable to the second floor. They found it and completed the work in a timely fashion. They worked quietly and cleaned up everything behind them. The cable vision works on the second floor. The two men called the office to get the amount for the invoice, presented to me, and went on to their next job. They did an excellent job today. 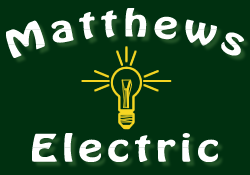 “I would just like to say that I could not have been more pleased with the service provided by Matthews Electric. Chris, Kieth, Steve and Kevin were the consummate professionals. Everything was done to perfection. They were courteous, hard working and prompt. I could not be happier with the outcome. Believe me, if there is more electrical work to be done, I know who I will call”. “It was a pleasure having you at our house – you people came in and did what you were asked to do and did what I requested to be done in a professional manner. Nice work Matthews Electric. Kevin and Tim did a great job!